To say it has been humid lately would be an understatement. And hot too. My hair is resembles an Afro wig, my skin sweaty to the point that it is difficult to separate skin from clothes, my eye glasses fog every time I leave the apartment. I am typing this as I sit under a a cloud of billowing cold air blasting from the AC. Sipping a cold ambrosia melon, lemongrass and bruised mint granita to nurse this heat hangover. My eyes are heavy, drooping from the weight of the sun. The sun which only grazed my body for those few minutes as I walked briskly from the elevator to my car on my way to to do the school run. That was more than enough. Yet, we aren't even in the thick of summer. The temperatures are still set to soar, this is the mere beginning. We have already been trying in vain to beat the heat by lounging by the pool, playing with sprinklers, opening the fridge for a gasp of cool air. To keep cool in this weather, I usually find solace in the form of slushies....any fruit will do. Whirled with a few bricks of ice, sometimes yoghurt and a touch of honey or sugar. We're ready to go.....and when I say go, I mean fast. Or you'll see it melt before you. 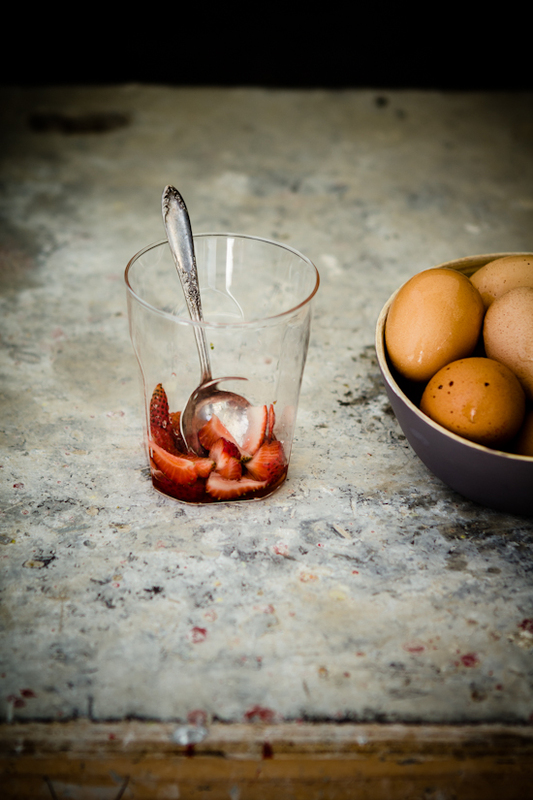 But before I give you the recipe for the melon slushy, let's talk about these strawberries. The ones that disappeared from our Farmer's markets weeks ago. The ones that I barely had a chance to nibble on before their time was up. Yet, whose sweetness still lingers in my mouth. Strawberry season may be over in Dubai but we're still able to find them in their troves thanks to American and British seasons. And nothing cools and soothes like strawberries with cream. A gentle cooling balm in this scorching weather. 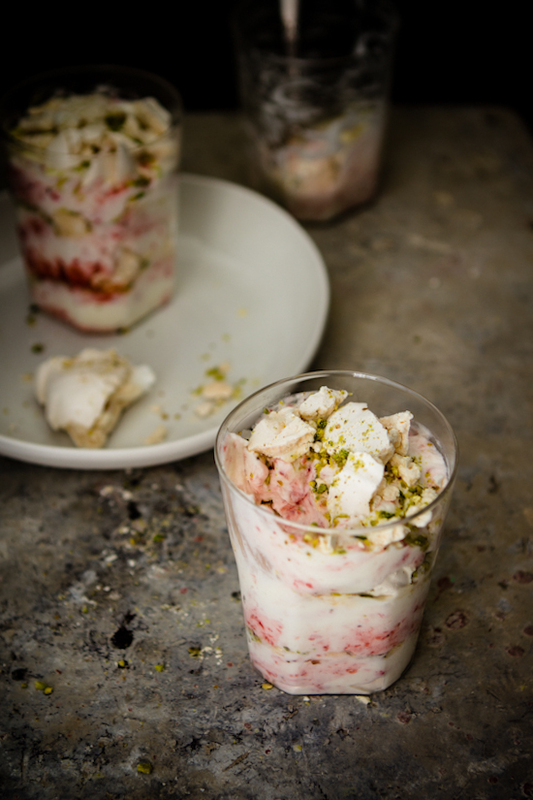 I decided to make this classic British dessert with a Middle Eastern twist. 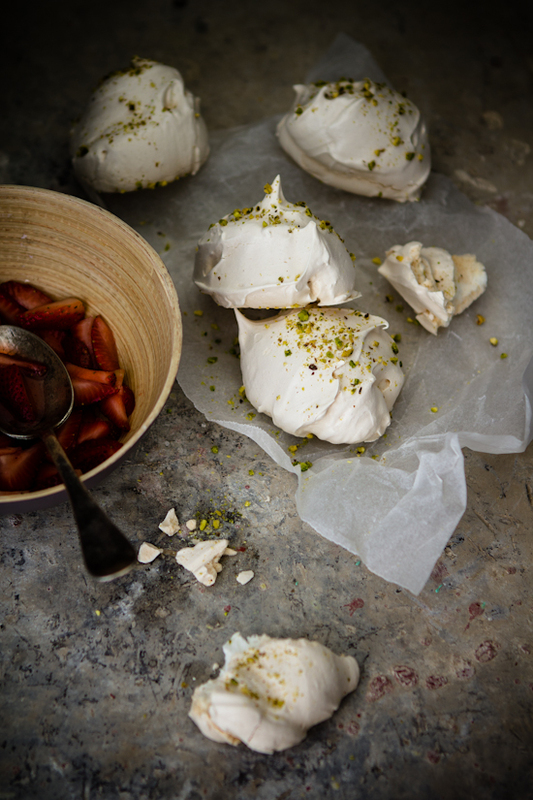 A splash of rosewater in the meringues and a scattering of pistachio nuts. You may leave both these out if you are so inclined. Meringues has also been on my wish list to both bake and eat for the first time. My first few attempts were disastrous- sugar syrup weeped from the meringues during baking (I didn't beat the caster sugar and egg whites sufficiently. Make sure it doesn't feel grainy or else beat them more). My second attempt didn't even make it ot the oven. I added vinegar and the meringue curdled. But third time lucky and one more dessert marked off the bucket list. Preheat the oven to 150 degrees Centigrade and line a baking tray with parchment paper. Tip the egg whites into a clean and dry mixing bowl and start beating at medium speed. Add the salt, Whisk until frothy. Whisking at high speed, start adding the caster sugar a tablespoon at a time, whisking 3-4 seconds between each addition. Whisk until stiff peaks form. The meringue will appear very glossy and puffy like clouds. It should not feel gritty (If it does, keep whisking until sugar has dissolved). Add the rose essence if desired and whisk for 30 seconds until incorporated. Scoop a large tablespoon of the mixture onto the baking tray, using another tablespoon to ease it onto the parchment paper. Leave a 1 inch gap between meringues. Sprinkle with pistachio and bake for 1 1/4 to 1 1/2 hrs, rotating after 1 hour. I baked mine for 1 hour and 20 minutes to achieve a crispy outer shell and a marshmallow centre. Bake for longer if you'd like it crispy all the way through. Turn the oven off and leave the door open. Allow meringues to cool in open oven. Break roughly by hand. Hull the strawberries and chop roughly. Add the caster sugar and allow to macerate for 30 minutes. Whiz into a puree. Beat the whipping cream until stiff peaks form (I added sugar to mine but that is optional). 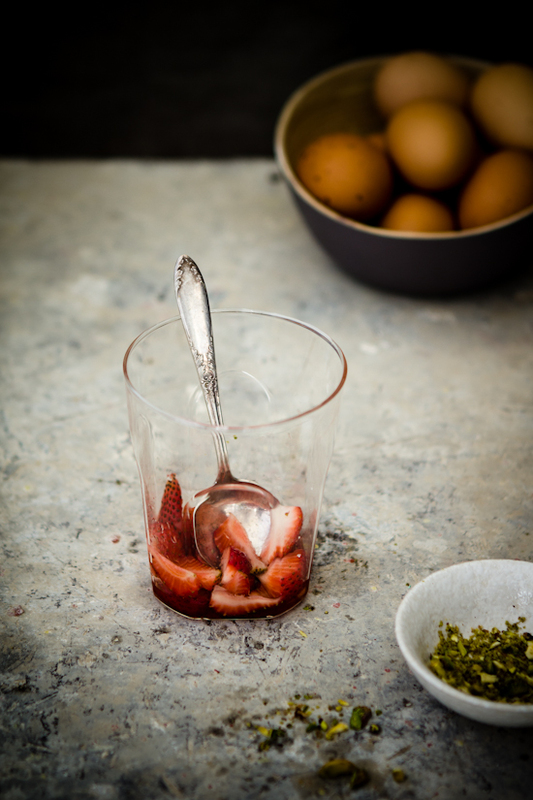 Fold the strawberry puree into the cream roughly to create a marbled effect. 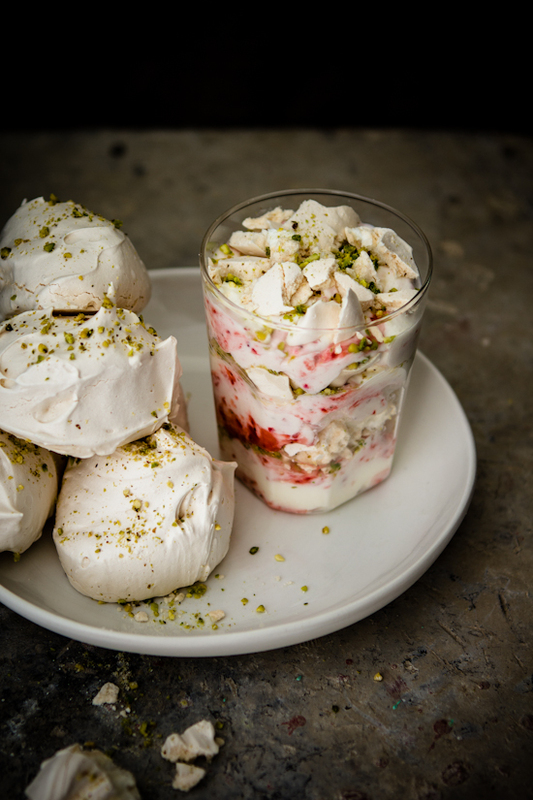 To assemble the trifle, start with a layer of strawberry and cream followed by a layer of broken meringues and lastly, a sprinkle of pistachio nuts. Repeat layers 3-4 times and serve immediately. Makes 5-6 trifles depending on glass size. Unbroken meringues can be stored in airtight container for 2 weeks. 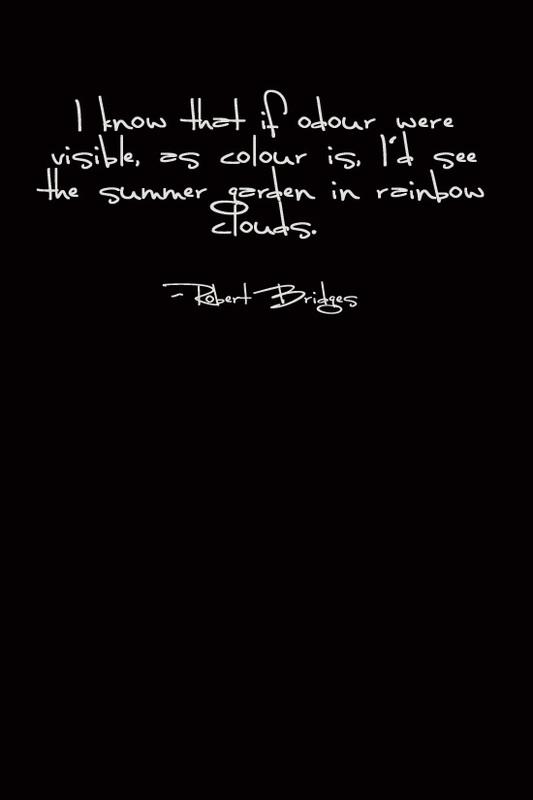 Delightful photography, great quote and a fantastic dessert! Irresistibly summery. Gorgeous pictures! Who could resist Eton Mess, yummy! Beautiful photographs! I love the darker look. Glad you made meringues too, they're so much fun. The rosewater and pistachios sound like the perfect touch to this classic dessert. I've been waiting for this recipe after seeing your photo on Instagram :) I think I can do this =) Thank you for sharing!! 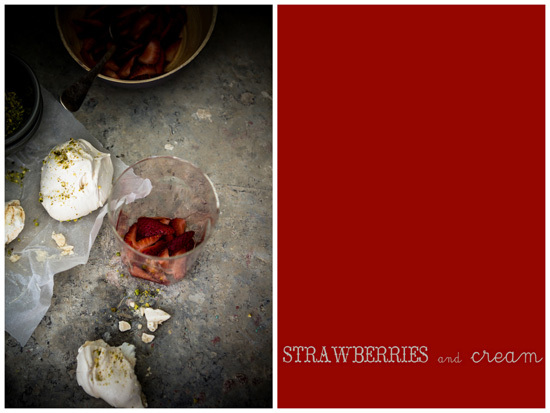 Beautiful photographs and recipe. Nice way to blend in the pistachios and rose water. Yum! Returning in a few weeks to Kuwait...heat is the one thing I am NOT looking forward to. This looks so delicious and summery. I love the added rosewater and pistachios. Gorgeous photos. This looks gorgeous!! Pinning it! Thanks for another beautiful post! Pinning this! My mum made something similar to this for my hubby and i when we returned for living abroad but she used fresh pom instead it was delish! Love the photos! How delicious. I introduced my kids to Eton mess a couple of weeks ago. The poor things are now on a gluten free and dairy free diet, so I worked with almond cream, banana, cinnamon meringues and date syrup. This looks far prettier, and I'm sure almond cream would work very well with the other flavours. Gorgeous. Gorgeous photographs! I like the dark colour (is it something new from you? :)), it's a great contrast for the white dessert! 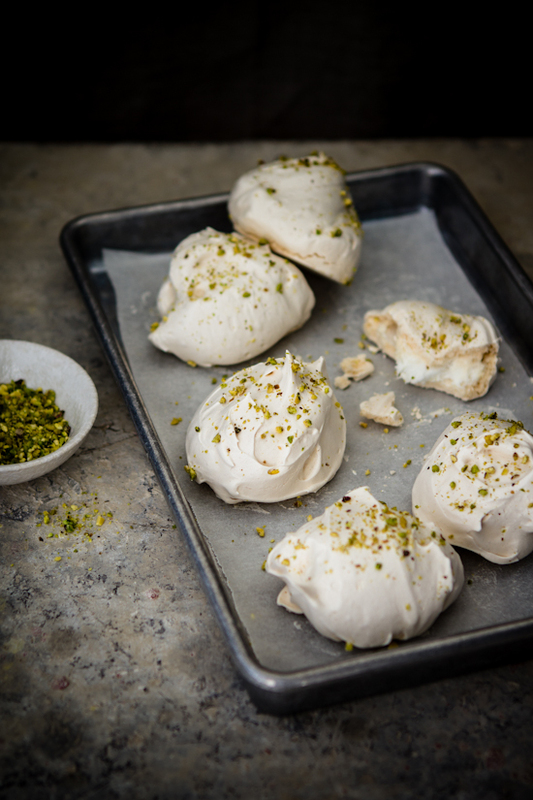 Your meringues turned out perfectly in the end - they remind me of the huge pistachio meringues you see in the window of Ottolenghi's cafes in London. OMG! What photography - am searching for words - genuinely! Pinning it, sharing it, tweeting it - I'm doing whatever I can! I've never tasted Eton Mess and the images I have seen looks nothing like this! The table top - the texture - phew loving it. The moment I had started feeling that most of your food shots (whatever I have seen) are done outdoors - you surprised me with this! so beautiful! 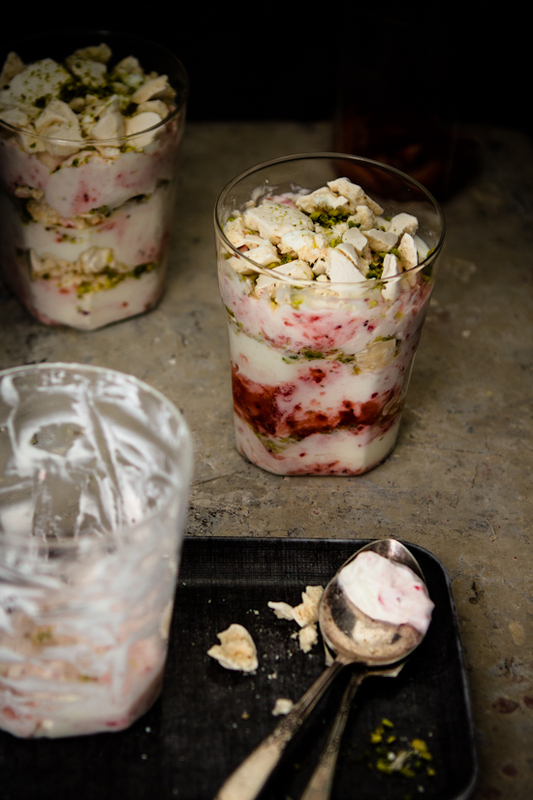 I love eton mess Sukaina and you made it so much more interesting! :) This post puts me in such a great mood. We've had days of what felt like we walked into an oven too - - it's going to be an intense summer. I'm so happy you shared this recipe though, it would be perfect for those summer days. And, well done on your meringues - - they are gorgeous!! These look delicious, beautiful colors! I kept scrolling from top to bottom and top again for the gorgeous photos. I love the shadows, the dark mood somehow takes away the heat and makes me feel cozy! gorgeous recipes & photos Sukaina! Hope it cools down where you are at! Absolutely stunning images! I love this new look from you, so different from your other photos, but equally as beautiful! Those meringues look like perfect little clouds. Sukaina this looks beautifully delicious! 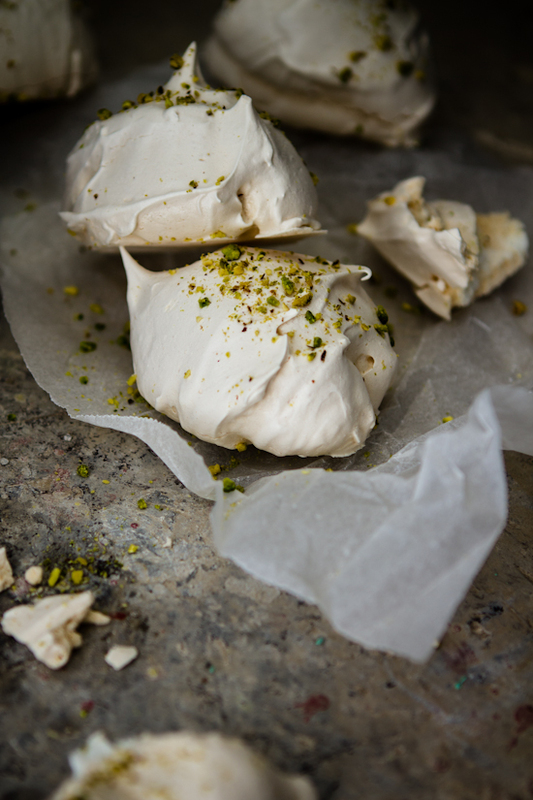 I love the crushed pistachio nuts on the meringues. Fabulous photography! Stunning, love it. So pretty and looks amazing! What an indulgence! Beautiful clicks! I have been planning to make it this weekend. Looks very good. Love the pics... with moody backgrounds. I like the dark background in the photographs! I used to make ghost shaped meringues as a kid but have dreaded making them now! Fearing they won't turn out as i expect them! 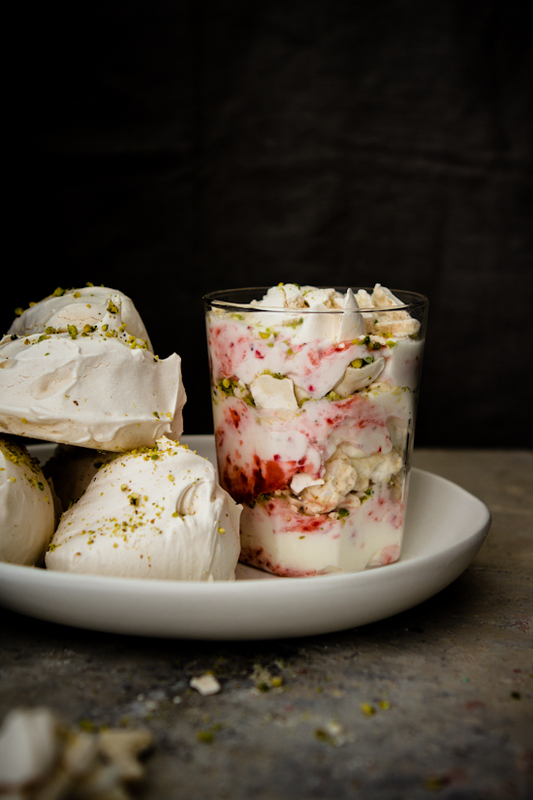 Your eton mess looks delicious!! Beautiful pictures. I can't wait to try this recipe. Mmm eton mess is so yummy and delicious! Your pictures are making me drool! 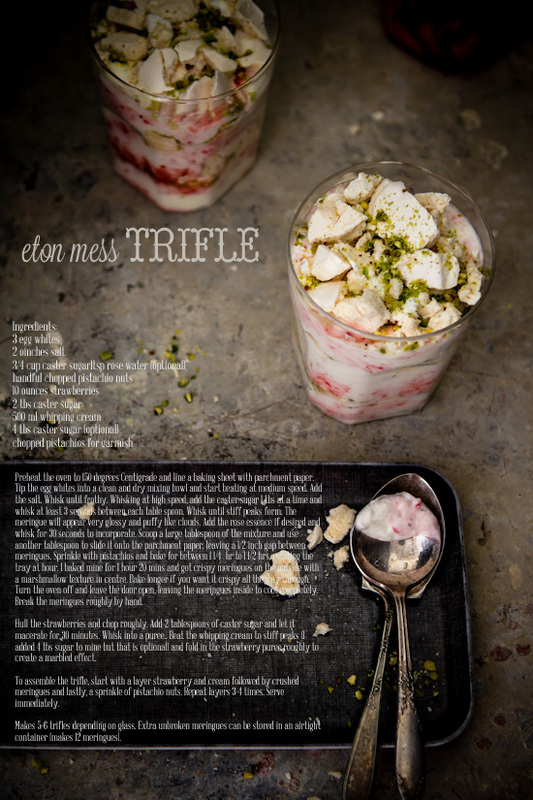 What a wonderful pics of eton mess trifle you have here. 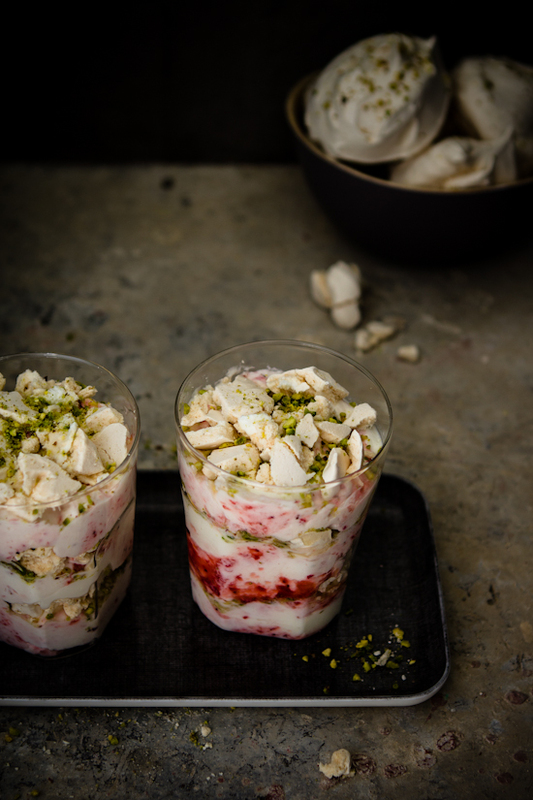 Gorgeous pictures!I have never tried Eton mess, lovely clicks and a must try recipe:).Watching the clicks I feel like picking one glass right away!! I came across your blog on the top 100 mom blogs. Congrats! You have a beautiful blog and this dessert looks fantastic. Such a coincidence, I am having guests over on Sunday and was planning to make Eton mess too. Your photography and presentation is beautiful. some of the most gorgeous food photography I have ever come across! wow so luscious and yummy! 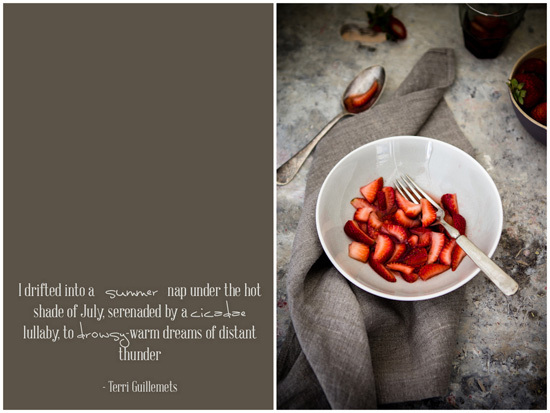 Beautiful images, wonderful description, tasty sounding trifle. These looks truly outstanding, I can't wait to try them! This blog contains the latest information about the healthy food dishes apart of it we deliver the yahoo Mail Support Phone Number 1(877) 271-9107 for making fix the issue. This looks so good! Can't wait to try this recipe! Thank you! Corporate Training Institute: Join best HR Training Institute for Freshers in Talent Magnifier with 100% job placement assistance. Looking for online slots for real money? Visit BGAOC.COM for more information and other gambling games!